Heat oven to 350°F (325°F for dark or nonstick pans). Grease and flour bottoms and sides of two 9-inch and two 6-inch round cake pans, or spray with baking spray with flour. In large bowl, make cake batter as directed on boxes. (Both boxes can be made at one time; do not increase beating time.) Spread 2 3/4 cups batter in each 9-inch round pan. Spread 1 3/4 cups batter in each 6-inch round pan. Bake 9-inch pans 24 to 29 minutes, 6-inch pans 22 to 27 minutes or until toothpick inserted in center comes out clean. Cool 10 minutes. Remove cakes from pans. Cool completely, about 1 hour. In large bowl, mix frosting and food color to desired color. Spread small amount of frosting around open edge of each cone. Coat frosting with sprinkles. Frost tips of cones; decorate with sprinkles. Trim off rounded tops of cake layers; place one 9-inch layer on serving plate, cut side down. Spread 1/3 cup frosting on top. Layer with other 9-inch cake layer. Frost top and around side with frosting. Place sprinkles around base of cake. Place 6-inch cake layer, cut side up, on top of frosted layers. Spread 1/3 cup frosting on top. Top with remaining 6-inch layer, cut side down. Frost top and around side with frosting. Place sprinkles around base of 6-inch cake. 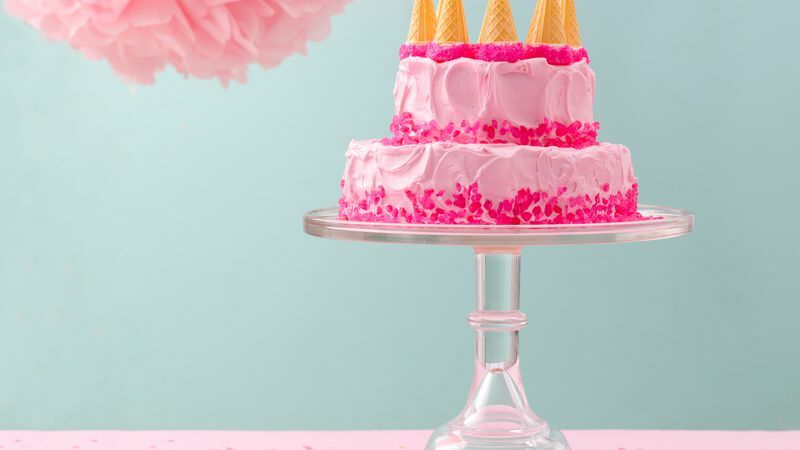 Place cones in circle on top of cake. Decorate with sprinkles in center of top of cake. Store loosely covered at room temperature. You can bake ahead and freeze the unfrosted cake (tightly wrapped) for up to 2 months. If you don't have enough pans to bake all the layers at one time, cover and refrigerate the rest of the batter while baking the first batch. Cool the pan(s) about 15 minutes, then bake the rest of the batter, adding 1 to 2 minutes to the bake time. Don’t have 6-inch round pans? Use four 8- or 9-inch round pans. Divide batter evenly among pans, and bake as directed on box. Cut 2 of the cooled cake layers to 6 inches. Rock candy sprinkles can be found online or at a store that specializes in crafts and decorating supplies.